Turkey Chili is the ultimate comfort food. This Hearty chili is easy to make with the healthy additions of ground turkey and fresh veggies (like onions and peppers). 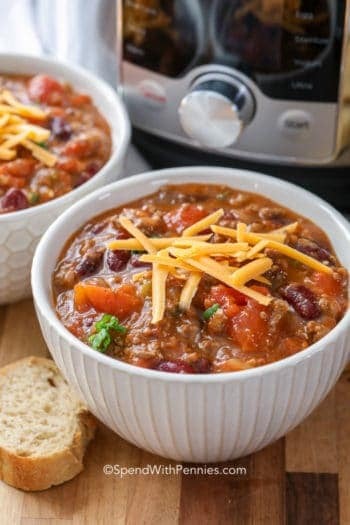 Serve this easy chili recipe with some homemade cornbread and all of your favorite toppings for the ultimate comfort meal! Turkey is one of my favorite proteins to cook with. 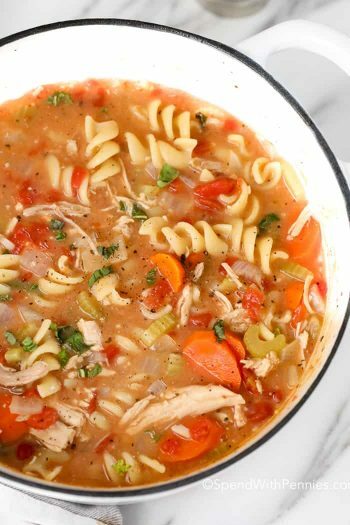 We love making roast turkey breast and of course substituting turkey in our favorite Pasta Sauce recipe! 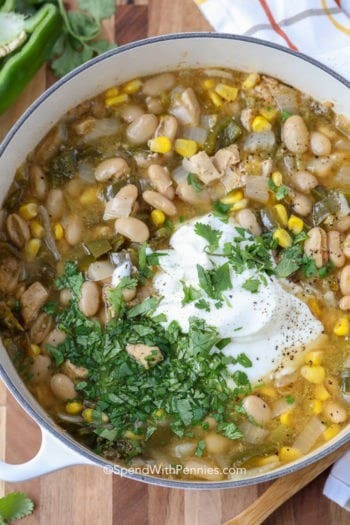 It makes a great addition to chili loaded with veggies and beans! Ground turkey chili is one of those comfort foods that we make often (of course along with 30 Minute Dinner Rolls or crusty bread). 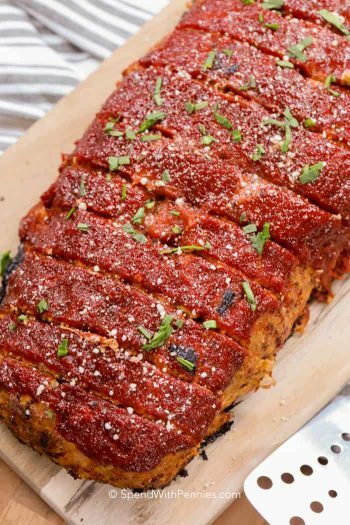 It’s hearty and delicious, it freezes well and its perfect served on game day alongside loaded nachos. In a large pot, brown the turkey with onions, garlic, and chili powder. Simmer for 35-45 minutes until thickened. Super easy peasy! The addition of red peppers adds a sweetness to this chili. If you prefer a less sweet chili, swap out the red pepper for green. You can also add other veggies to this recipe like mushrooms or zucchini. 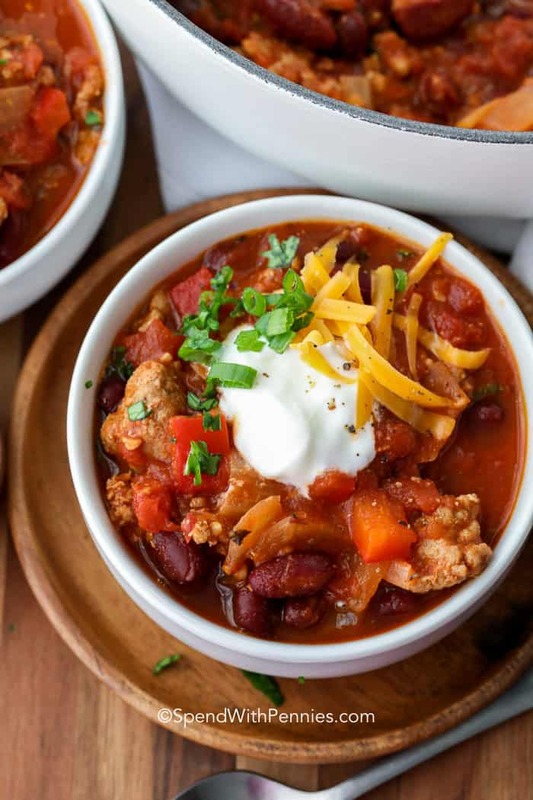 This easy turkey chili recipe can easily be adapted to and be cooked in the slow cooker. That way, you can come home to a delicious bowl of hearty chili that’s ready when you are. 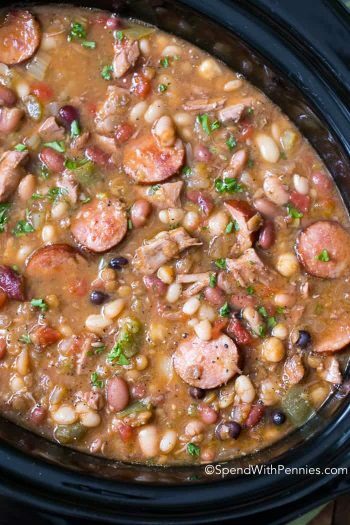 (I use a 6QT Crock Pot for this recipe). Brown the turkey, onion, chili powder, and garlic. If your chili is a little too thin for your liking, just cook it a little longer (uncovered) to reduce the liquid a little more. If you’re a little pressed for time, not to worry! Create a slurry by mixing a tablespoon of water with a tablespoon of cornstarch. Add this to the turkey chili a little bit at a time to help thicken it. Chili is a complete meal in itself, so it doesn’t really need anything. I do however love serving it alongside some cornbread or easy dinner rolls. A nice side caesar salad is always great alongside turkey chili too! We add our favorite toppings like sour cream, cheese, green onions or jalapenos. Top it with whatever you’d like! Chili freezes well, making it the perfect make ahead dish. I like to freeze it in individual servings so I can defrost individual portions. To reheat turkey chili, just heat it up in a saucepan on low. In a pinch, the microwave will also do the trick. Just make sure you stir it every 60 seconds so it reheats evenly. 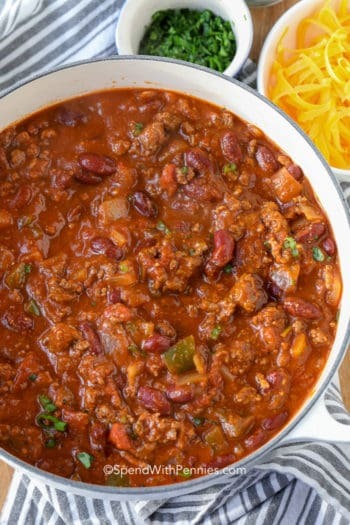 Chili will last 3-5 days in your refrigerator if stored in an airtight container. Chili should last up several months in the freezer. 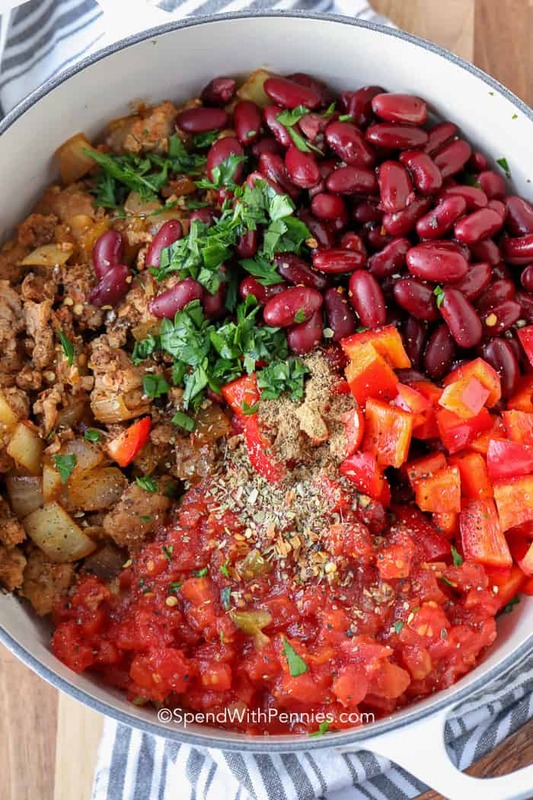 Homemade Chili Powder – perfect for this turkey chili! Sauteed Mushrooms with Garlic – delicious addition to this easy turkey chili recipe. 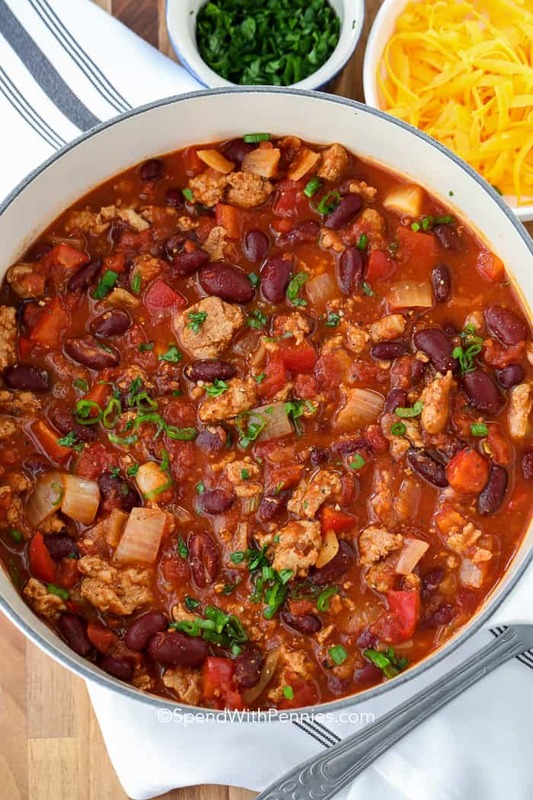 This turkey chili recipe is the ultimate comfort food. 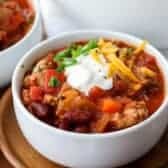 Hearty chili is reimagined with the healthy additions of turkey and other delicious ingredients. Brown ground turkey onion, garlic and chili powder until no pink remains. Add remaining ingredients and bring chili to a simmer over medium high heat. Reduce heat to low and let simmer 35-45 minutes uncovered until thickened.